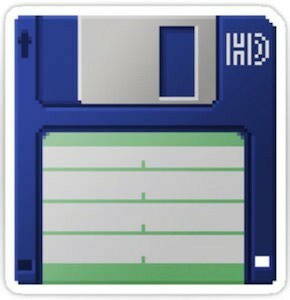 Do you remember the floppy disk? If you do then you probably a little bit geeky and maybe a person that likes to remember. 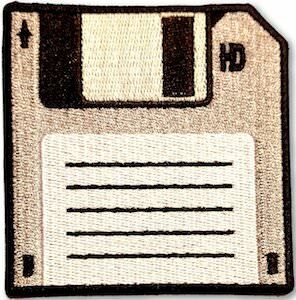 Now there is a cool clothing patch that looks like a floppy disk. The clothing patch is 3 x 3 inches and is an iron on patch that you could sew on too. Now you can fix clothing or make them look really cool all thanks to the classic floppy disk. And by adding this patch to you clothing, bag, or even your hat you can show your friends that you didn’t forget about the classic tech. So lets bring some class to your gear by adding this Floppy Disk Clothing Patch. 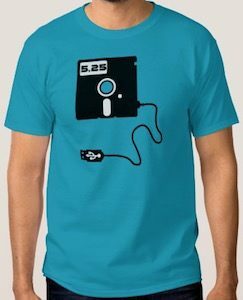 If you remember the classic floppy disk then you can smile about this t-shirt and if you don’t remember then you just ran out of memory just like the disk on this t-shirt. The t-shirt is available in styles for both men and women and comes in different colors too and in sizes Small – 6XL. On he t-shirt you can see a sad looking floppy disk and yes it even have arms and legs. Around the disk it says “My Brain Can Only Store 1.44MB of Data”. So if you have a small memory the wear this t-shirt so that people around you can’t blame you when you forget things. 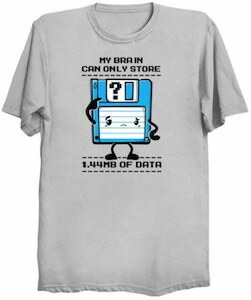 Don’t wait any longer just get your My Brain Can Only Store 1.44MB Data T-Shirt. This sticker shows how many years ago we took files with us. Yes this is a vinyl sticker of a 3.5 inch floppy disk that could hold up to 1.44MB. A sticker like this is great fun for on a laptop, portable hard drive or anything else as you could even put it on your car. The vinyl sticker can be removed without leaving residue behind and that makes it fun as you can just remove it when you want. This die cut floppy sticker comes in many sizes so that you can get it the way you would want it. Come take a closer look at this 3.5 Inch Floppy Disk Sticker. A floppy disk drive is something I didn’t use in a long time but the other day while cleaning the house I found some 3 1/2 floppy disks and I wonder if I still needed what was on it. If still use or would like to get to data on old 3 1/2″ floppy’s then you are in luck. This black external floppy disk drive will work on pc and mac and will give you access to your old files. It support 720KB and 1.44MB disks. Power will comes through the USB port so just plug and play. Come and check out this USB Floppy Disk Drive. Geeky people like me like to look back at the past and laugh. 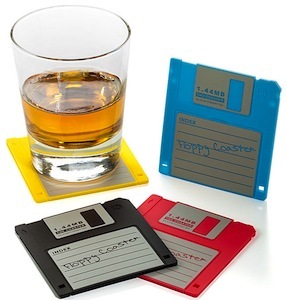 And now we can have coaster on our tables that look like 3.5″ floppy disks. They are not real but they look real. They are perfect for a nice glass of your favourite drink and make you think that there where days that 1.44MB was a lot of storage space. And now I carry around a mobile phone with 32GB of storage. And these coasters are not just fun and geeky they are useful to as now you don’t have to clean your table so often. So look back at the past and order your set of Floppy Disk Coasters. If you are old enough then you will remember the days that we had floppy disks on witch we would store are data. 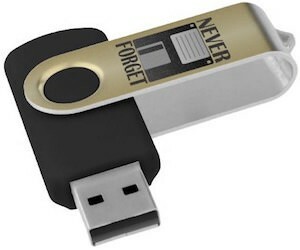 And now you can have the floppy disks back but then in a fun way to remind you of the past. 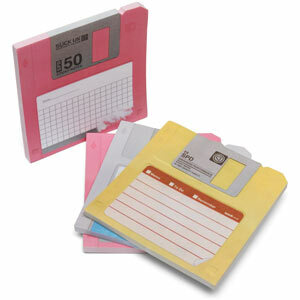 These floppy disks look like floppy disks but are not they are sticky notes. Just write on them and stick them where ever you want. But don’t try to put them in to your floppy disk drive (if you still have one). Every package comes with 3 floppy disk sticky notes pads in assorted colors and that means loads of fun. Go check out all the cool things you can do with these Floppy Disk Sticky Notes.